New card game with the 32 greatest concert houses in the world. After its grand opening in August 1998, the Concert Hall of KKL Luzern is this year celebrating its 20th anniversary. There are several anniversary events and activities planned to mark the occasion. 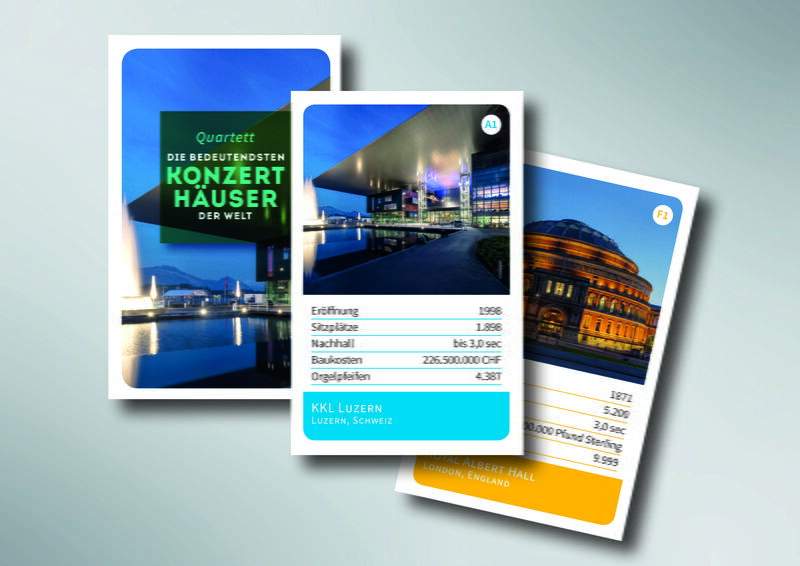 A very special edition of the quartet card game is also appearing just in time for the anniversary - featuring the world’s greatest concert halls. The new quartet card set is a tribute to thirty-two incomparable concert halls renowned internationally. For example the Royal Albert Hall in London, the Concertgebouw in Amsterdam, the Elbphilharmonie in Hamburg and KKL Luzern too, of course. There are some fascinating figures for players to take in: as they compete for halls with the largest number of seats, the longest reverberation or the most organ pipes. This beautifully-made game featuring the world’s best-known concert halls offers endless entertainment. It’s almost as good as going to them.